Down To Earth is a product of our passion for change. 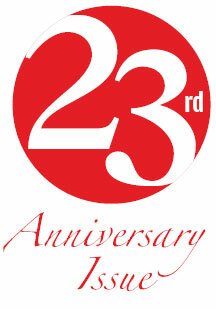 But it would not have made it to its 23rd anniversary without your continued commitment. Our desire is to bring you news and perspectives on the state of the environment and explain why it needs attention. It is clear to us that as we produce each issue—this is 552nd edition—the struggle for a green, but prosperous, world is getting more intense, contested and difficult. It is also clear that if we do not have independent and credible sources of information, we cannot even begin to move towards resolution. This is your magazine, literally. Down To Earth’s finances are straightforward. We continue to print because you continue to read us; send us annual subscriptions. In this issue, we also bring you a new-look Gobar Times. We hope you like it, as this is our educational product, available only to you—our subscribers. We believe we have a huge unfinished agenda. There is no doubt that the world (and India) has evolved since our first edition in May 1992. Environmental issues are now part of the mainstream. We read about pollution in our cities in newspapers; governments swear to clean up rivers and remove garbage from our streets. But in this change, our role is even more acute: to examine proposals; to critique actions and to suggest ways ahead. Our best work is to learn about who is doing what to make a visible difference. Our best day is when we hear that our effort to bring the “good news” has been recognised. Someone, somewhere has learnt from it, replicated it. In this season of despair—when unseasonal rain, freak storms, hailstorms and the prospect of a failing monsoon have robbed farmers of hope—we make a renewed vow. We will bring you good and bad news from farms, laboratories, factories and homes. We will continue to show the way ahead in building a fair, secure, liveable and healthy world. It is our duty to hope. It is our duty to you. I have been giving lot of respect to the articles of this magazine. The comments like 80-90% of Delhi shall fall in earthquake do not appeat to be apropriate from your magazine. If you consider the shanties and un-designed buildings even then your estimate look only that of media to catch attention and cheap popularity. Keep on adding good work to your credit and not the numbers. Congratulations on your 23rd Anniversary. DTE has indeed brought environmental issues on to the political agenda despite the politicians. But as you say, much more remains to be done. That you are at it and will continue to do so is a big Hope for future generations to inherit a world where life support systems still work, and not just for humans. Where One species is not allowed to obliterate thousands or even millions of others in the pursuit of wealth or progress or 'development'. One feels, however, that while environmental concerns are overwhelmingly viewed through the prism of human centricity, the greater threat to planetary ecology and therefore to the world economy, due to rapid species extinction is being hugely underplayed. Either we don't understand what is happening or are unable to grasp the impact of the accumulating loss of life will have on Earth. This one area needs VERY SPECIAL attention and DTE could lead the way. Also because the 'victims' here are vote-less and voiceless. Congratulations on your 23rd Anniversary Issue. DTE has indeed stood for giving focus to environmental issues like climate change and natural hazards.Very few people are ready to accept these hard realities of life and endeavour to see positive and constractive changes in the society. MS.SUNITHA, CONGRATULATIONS ON YOUR 23 RD ANNIVERSARY ISSUE. Your passion for subject, your conviction for results, your boldness in reporting and your modest submission puts you on a very high pedestal on the environmental arena. A lot has been discussed and very little has been done to safe guard our planet earth till now. Latest reports confirm we are already on in a "eco-deficit" . Governments, N.G.O. 's, Corporate, Universities and of-course every one of us being citizens have to think more boldly, and draft design and deploy more stringent measures and have to adhere to them to handover this planet earth in the same position to our next generation if nor in a better way. I wish you continue with the same spirit and motivate the younger generation to march ahead with more zeal and enthusiasm to safe guard the planet earth.